Heidi Adkisson, a former professional chef and now the Editor of Ward Street Bistro, is back and is cooking up a great Risotto! Not long ago, Heidi showed us how to make Berry Fruit Crisp which was fantastic! She has been keeping busy doing scrumptious looking photo-tutorials at the Ward Street Bistro. (For example, the Corn Fritter Casserole is a “light” take on a southern classic, and the Market Seafood Chowder is to die for!) I am delighted to welcome Heidi back to startcooking.com! 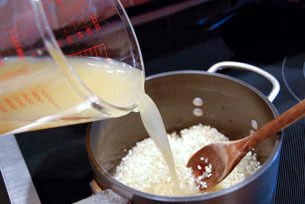 Ah, risotto. Rumors are it requires constant stirring during a 20-minute cooking period. It sounds daunting. 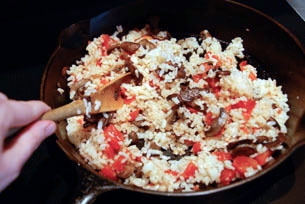 But, the fact is, you can make a delicious risotto-style rice dish with no stirring required. I’m going to share with you my mushroom-and-tomato version. It makes a special side dish for a larger meal – or works as the centerpiece for a vegetarian meal. …but I want to focus a minute on the rice. 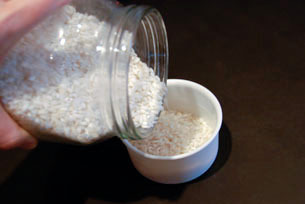 Using the right type of rice (Arborio) is important to get the moist texture that characterizes risottos. 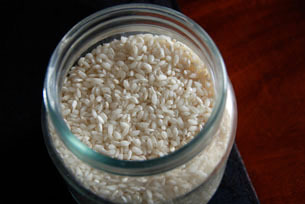 Arborio is a medium-grained Italian rice that’s high in starch, which results in a creamier texture than long-grained rice. 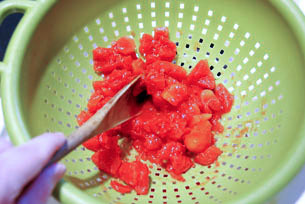 1) We’ll start with 1 (14.5-ounce) can diced tomatoes in juice. 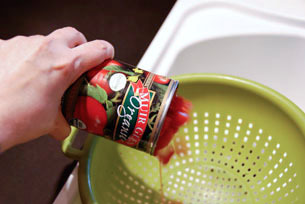 To concentrate the flavors, drain the tomatoes in a colander (reserving the juice for another use). 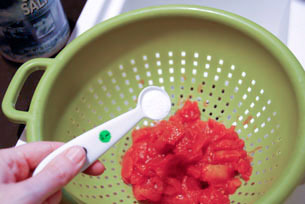 2) To pull additional moisture from the tomatoes, sprinkle them with 1 teaspoon of salt. 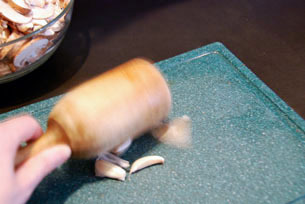 3) Stir to incorporate the salt evenly. 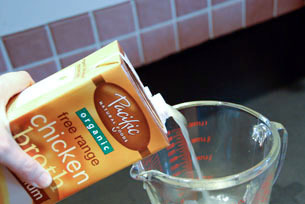 Let this mixture drain while preparing the other ingredients. 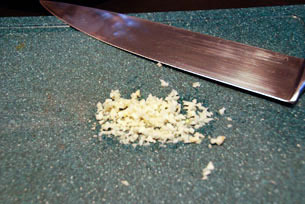 4) To prepare 2 cloves of garlic, first peel the cloves. To loosen the skins, I give the them a gentle whack with an old wooden potato masher, but the more conventional method is to press down on the cloves with the side of your knife. 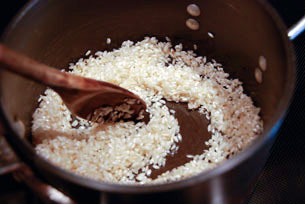 …and 1 cup Arborio rice. 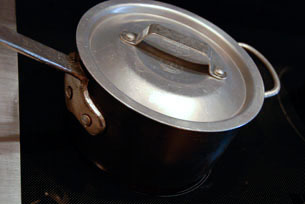 7) Place a medium saucepan with a heavy bottom over medium-high heat. 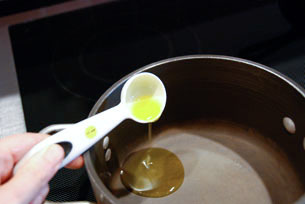 Add 1 tablespoon of olive oil. 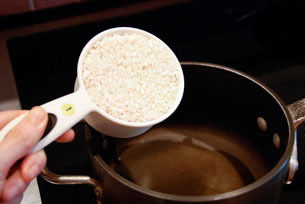 …and stir to evenly coat the grains of rice with the oil. 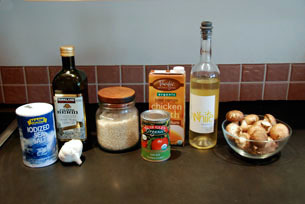 (This will prevent the risotto from becoming mushy.) Saute the rice, stirring, for about 1 minute. 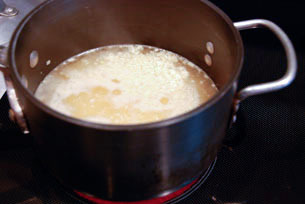 10) Bring the mixture to a boil, stirring once. 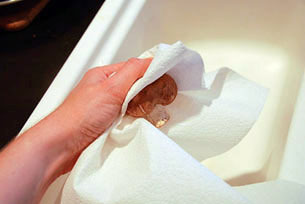 11) Cover and reduce heat to medium-low. 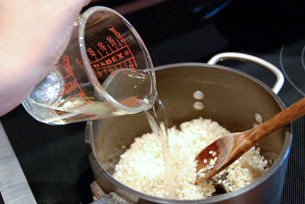 Cook the rice for about 20 minutes: you want the rice to be tender, but still slightly firm to the bite. 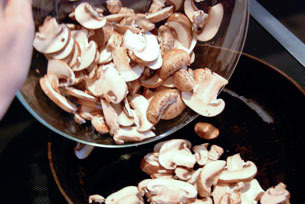 While the rice is cooking, prepare the mushrooms. 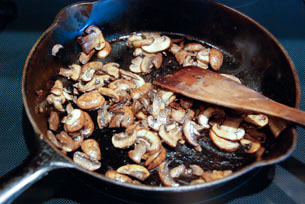 13) Heat a large, heavy skillet over medium-high heat. 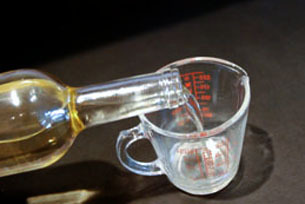 Pour in 1 tablespoon of olive oil. …and saute until all the moisture has evaporated, about 10 minutes. 15) To the skillet add the drained tomatoes. 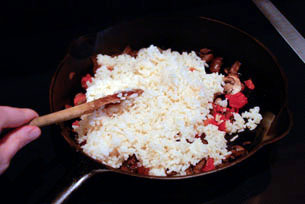 16) As soon as the rice is cooked, add it to the skillet. 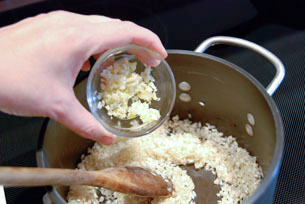 17) Stir to combine.The texture should be moist and creamy. If necessary, add a bit more broth. Taste and add more salt if desired. 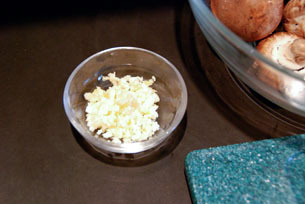 18) Serve immediately garnished with some freshly-grated Parmesan cheese. This is a basic recipe that can be used with all sorts of ingredient combinations (vegetables, sausage, seafood, herbs…). Rather than garnishing with cheese, you can stir it in at the end. For extra richness, finish the dish with a tablespoon of butter. 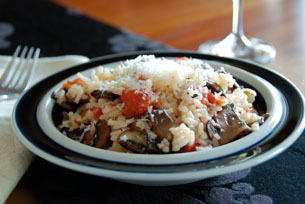 Risotto makes a great weekday meal and really doesn’t take much more time than making a pasta. Serves 2 as a entree; 4 as a side-dish. You can view and print this recipe here. If you are new to startcooking, or are a regular visitor here, please consider subscribing for free. I can’t wait to try this recipe. I really like the idea of using canned diced tomatoes that have been drained and the flavor intensified. 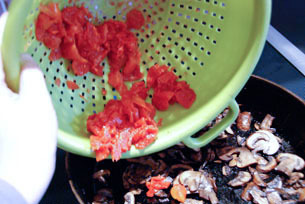 Often sun-dried tomatoes are added to risotto which I find to be a bit overpowering. 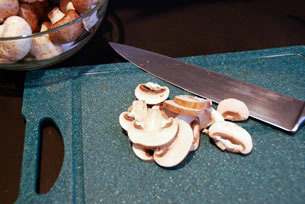 Plus, except for the mushrooms, all the ingredients are ones you can buy in advance and have them happily sit in the cupboard until you are ready to startcooking! 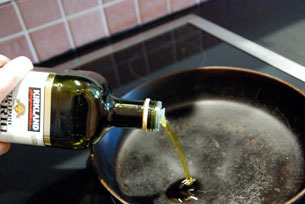 Are you a busy person who just never got around to learning the basics of cooking? We built startcooking.com just for you. You'll learn how to make quick and tasty meals, plus learn the basic cooking skills you'll need. Get ready to start cooking!